There’s a new website dedicated to training in the Blender3D 3D software program. The site is run by Neal Hirsig, a senior lecturer on "3-dimensional computer assisted design and the art of multimedia" at Tufts University. There’s an extensive number of tutorial-based lessons in PDF format and also RealMedia and Quicktime video tutorials. According to Hirsig, it is "an introductory course, it [providing] a basic understanding of the skills and techniques employed by 3-D designers in a wide range of applications. [It explores] basic mesh modeling, applying textures and materials to 3-D objects, lighting, animation and rendering . . . [providing] a good basis for further independent study in architectural, engineering and theatrical modeling and game design" (1). The program appears in a self-paced format, neaning that the tutorials can be taken in any order. The program is available online as a free resource. 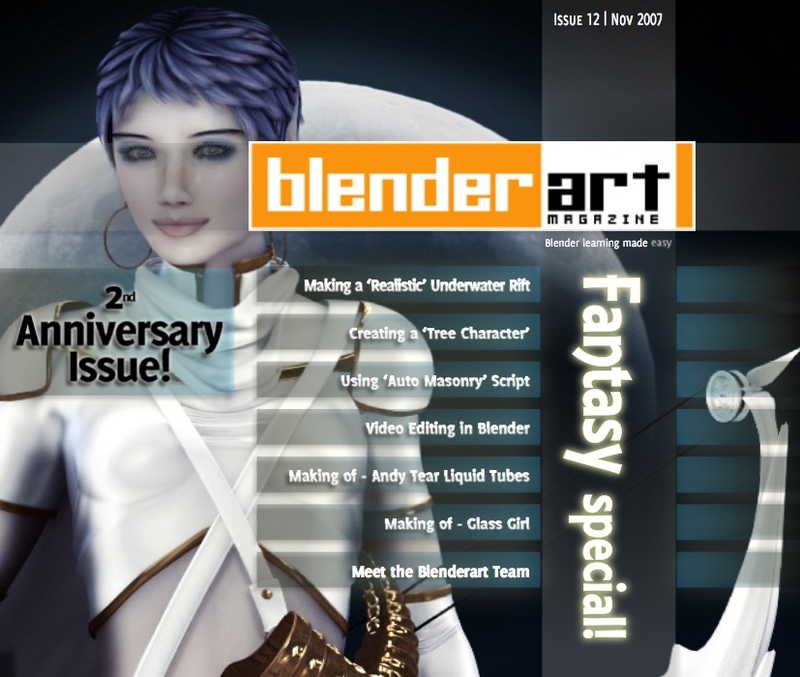 Issue #13 of the BlenderArt magazine (or e-zine) has been released. It contains impressive amounts of info regarding the Blender3D software. This 2nd anniversary issue provides community news articles, an editorial section, step-by-step tutorials, and detailed "making of" project overviews. This time there is a wide array of topics covered from using a python script to video editing using Blender’s native video editing function. An extensive gallery of 3D art rounds out this enjoyable and informative magazine.